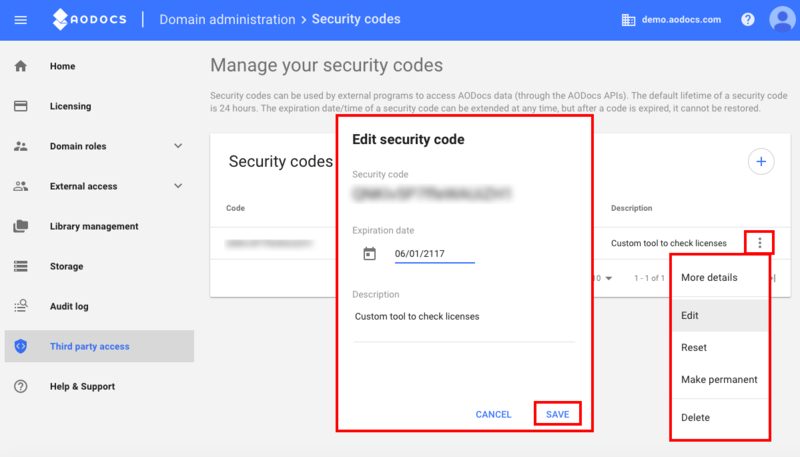 Security codes are used by an external program to access your domain's AODocs data using the AODocs application programming interfaces (APIs). Security codes provide access as a specific user or as a super administrator. Important: Only AODocs super administrators can create security codes. 2. Select Third-party access. The Security codes table is displayed. By default, security codes are available for 24 hours. After this period, security codes can't be used and are no longer listed in the table. Note: You can edit the expiration date of your security code to make it available for more than 24 hours. 1. Press the + button. Super administrator: this allows operations with the security code by super administrators. Same as user: this allows operations with the security code by the specified user. If you choose a super administrator email address here, the security code will be active but its scope will be limited. 3. Press Save. The security code is generated and displayed in the table. 1. Select the security code to edit. 2. Open the More actions menu and select Edit. 3. Select a new expiration date after the current date. 2. Open the More actions menu and select Make permanent. If you select this option, the expiration date becomes the current date plus 24 hours. 2. Open the More actions menu and select Reset. Your changes are applied immediately. Security codes are kept for one week after their expiration date. During this week, the codes are no longer active and can't be used. However, as a super administrator, you can reactivate them. In the security code list, expired security codes are greyed out. 1. Press the refresh icon. The expiration date is updated to the current date plus 24 hours. 2. You can edit the expiration date. 3. Add a description for the security code. 1. Select the security code to delete. 2. Open the More actions menu and select Delete.